Making rakija involves five main stages: harvest, preparation for fermentation, fermentation, distillation and aging & storage. The distillation process involves heating the fermented fruit to separate the alcohol from the water and pulp. This alcohol rises into the coils or pipes leading from the top of the still where it then travels to the condenser where it is cooled and then condensed into liquid. The condenser is normally a large barrel of water and inside the barrel is the winding pipe that the rakija travels through. The first ¼ or ½ liter (depending on the size of the batch) is very potent, and can be poisonous. The final drippings from the distillation process also contains impurities. The purest rakija is found in the heart of the batch. Traditional stills can be made from copper or steel and vary in size, shape and materials, and these are just part of the many elements that can influence the batch of rakija. 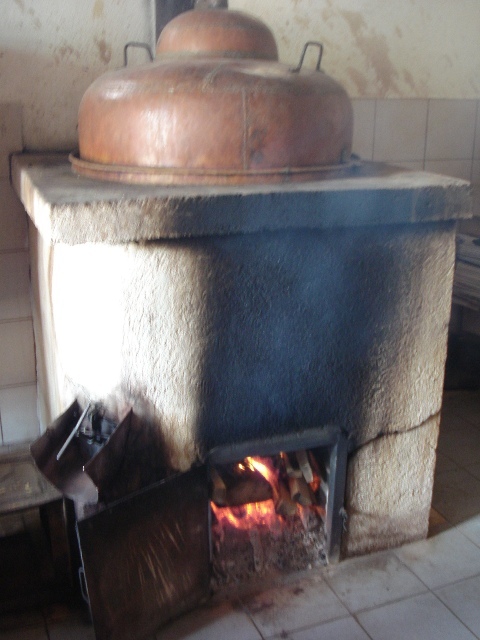 My Godfather, When making rakija, Vanco, uses a still (kazan) with a copper bottom and a ceramic top. The ceramic top is credited with helping to better separate the various alcohols and ensure that the purest alcohols are what ends up being cooled and condensed. Even pure rakija can be potent and it is advised that rakija be aged for at least six months in an air tight container prior to consumption. It is a warm spring morning. I parked out front of the winery and smiled at a dog sleeping in the shade. The dog lazily lifte d its head to wink at me and seemed very happy that he did not have to get up. I went upstairs and found Aleksandar Bogevski, my host for the day, sitting at his desk busily preparing paperwork for UK visas to attend the London Wine & Trade Fair in a couple of weeks. Shortly, Aleksandar took me to meet Boris Necev, their oenologist who quickly led us to where he and Dimitar (Dime) the Master Distiller, had just fired up the still. Today, I have the pleasure to share in the experience of Bovin making their Sveti Trifun Rakija (Black Label). 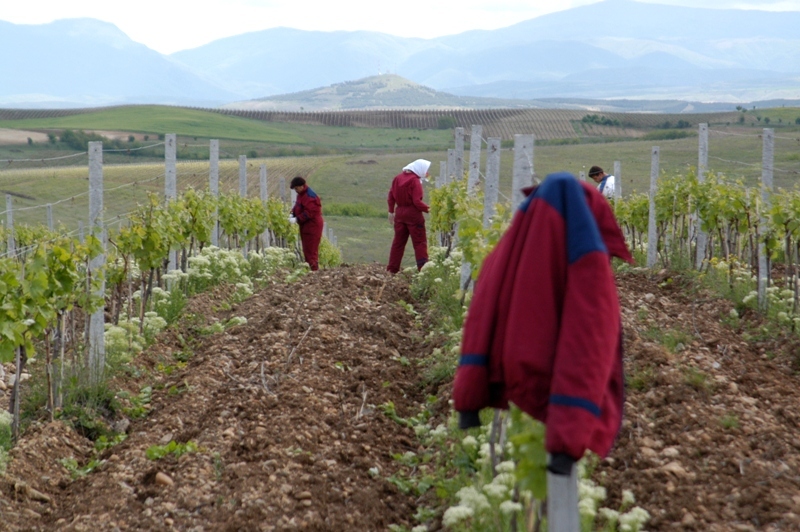 As many know, Sveti Trifun is the guardian saint of vineyards, wines and the people involved and every year on 14 February, there is a Sveti Trifun festival in Negotino. The first part of distillation is 70% alcohol by volume (ABV) and they stop the process when it gets down to 45%. Anything less than 45% is not used. The average ABV of the entire batch is 55%. Boris methodically measures the alcohol content from the počna (beginning), until four to five hours later when the rakija reaches 45°. Boris shows me their method for filtering out methyl alcohol (aka, methanol, wood alcohol) and the largest c oncentration of methanol is in the beginning of the distillation process. 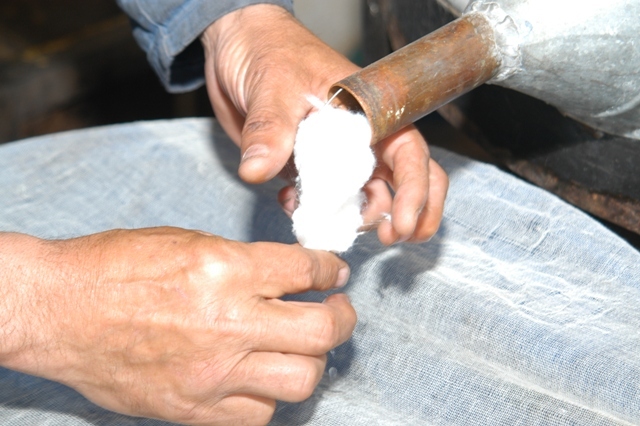 Dime affixes cotton to the spout of the drum where the alcohol is cooled after evaporating from the still. The alcohol drips from here into a beaker, partially filled with water, that is placed in the drum below the spout. As methanol is heavier than water, the methanol stays in the beaker so it can be discarded later. This process also removes other volatile organic compounds such as ethyl acetate and acetaldehyde. Consumption of as little as 10 milliliters of methanol can cause blindness and subsequent quantities can be fatal. The reason for cutting the distillation off at the point of 45% is to prevent the inclusion of other organic compounds and fusel alcohols such as amyl alcohol which has a strong smell and a sharp burning taste. These fusel alcohols not only can harm the quality of the rakija but can also cause headaches and nausea. In the end, we are left with the purest and most pleasurable alcohols and compounds. Bovin sends samples to three different institutes, only one is mandatory, for testing and analyses. The combined efforts of these institutes analyze samples for total acid, methyl and ethyl alcohol, aldehydes, esters, total extract, high alcohols, total acid, total sulfur dioxide, furfural, for heavy metals such as lead, cadmium, arsenic copper, zinc, and iron, and for pesticides such as dichlorvos, diazinon, malathion, parathion, and trichlorfon. Input. 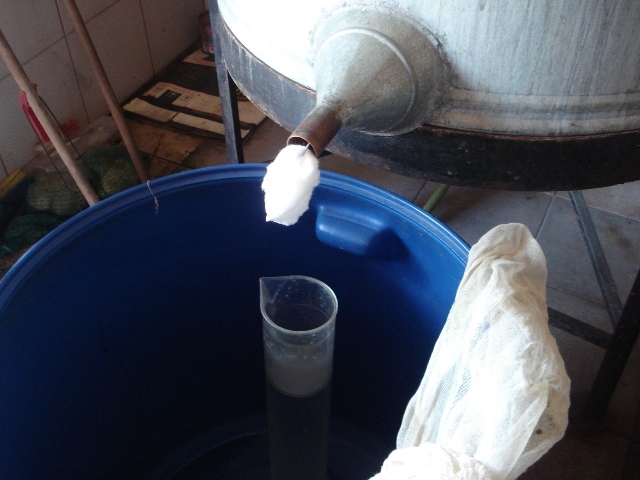 The source to be distilled begins after the fermentation of the grapes when it is time to extract the wine and Bovin begins to empty its tanks. Up to70% from a kilogram of grapes can be used for wine but Bovin uses only 45%, and they select this 45% from the natural gravity flow of what comes from the bottom of the tanks. By weight, the first 45% that comes out freely is the best. The rest is pumped and will be used later to make rakija. Bovin distills wine only, no pomace, no sediment and the rakija is twice distilled. The wine that is distilled is a combination of all the wines that they produce which is typically 65% red and 35% white. It is important to note that the combination of wines to be distilled is predetermined. First tasting. After explaining the set-up at the still, Boris takes us over to a tank and we try a sample from a single distilled version. Amazingly, there was no severe sharpness to the nose, which is partially due to the quality of what is cooked and partially due to the process. This sample was very aromatic, like white raisins basking in the sun. Very fruity aroma. Second tasting. Next, we sampled a double distillate. It is much more complex and fragrant. It is smoother but not as fruity as the single distillate. Aging. Bovin uses select Macedonian Sweet Oak to age Sveti Trifun Rakija. Bovin has a contract with woodcutters who have licenses to cut down trees from state owned properties. Bovin selects the trees that they want cut and the wood cutters do the rest. The leftover wood from making the barrels is used as firewood to heat the rakija stills. Sveti Trifun Rakija is first aged in a stainless steel tank, then transferred to old barrels for a period of 20 to 40 days, returned to the tank and then to a new barrel for 5 to 6 months. The used barrel provides “vkus na prvo” (first taste), wood aromas and tannins. The new barrel provides color, tannins and other wood flavors to the rakija and the actual length of time in the new barrels varies depending on the rate of color extraction. The entire process takes about one year. Third tasting. We are now sampling rakija after it has spent 30 days in the old barrels and it is unfiltered. It has a very nice oaky aroma and a slightly oily mouth feel due to the presence of wood tannins. When Bovin filters the rakija, some of the wood aromas will disappear. They use a classic filtration system with 2-4° micron gaps in the filters between the time the rakija is aged in the old barrels and before it is put in the new barrels. In the end, Bovin performs cold stabilization (chill filtration) of -20° to -21° Celsius, and then perform the classic filtration again. Fourth tasting. Now we are sampling rakija, 45% ABV just before the final filtration. Wood aromas are not as pronounced as the last tasting but now there is much more presence of herbs followed by a splendid pepperiness. A delightful balance and combination of flavors. After this rakija is filtered and is bottled, it will need at least six weeks to settle down before it can have “release”, real taste. Fifth tasting. This is not the tasting of the final product but the initial rakija as it is dripping from the still. An interesting blend of soft fruit, sharpness, wood glue and mild spice. We tasted it only, we did not swallow any of the sample. After a vi sit to their main vineyard, meeting and talking to workers clearing off lačenje (lower growth) from the vines, we returned to the winery for a wonderful lunch. We began with meze and the sixth tasting, the final product of Sveti Trifun Fine Rakija. A great tour and experience of making rakija.